Triple the magick with a set of 3 candles that have been dressed and rolled in specific herbs and herbal combinations for a variety of intentions. 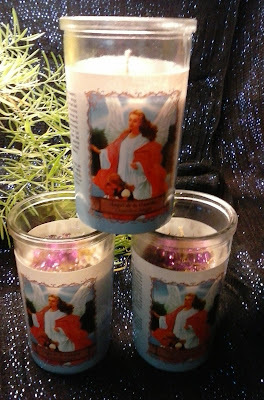 with this set of 3 candles in 3 sizes. 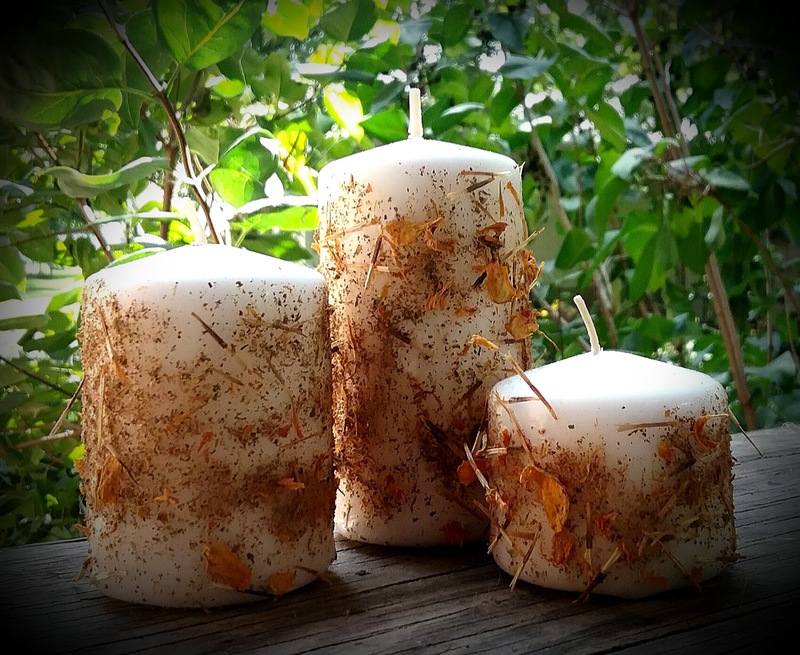 Note: Candles rolled in herbs can take off burning pretty dramatically when the herbs catch fire, so be extra cautious when burning these candles. 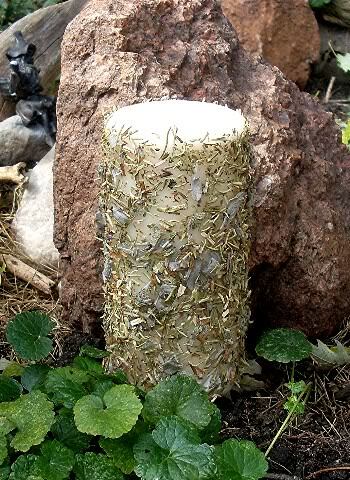 Make sure they are in a fireproof receptacle and never leave a burning candle unattended! The following candles are Tea Light Chakra Candles loaded with Essential Oils; Herbs; Crystals & Stones. These candles are $3.00 a piece, sold in bundles of 3 or 6.
on a higher spiritual plane. I connect with the Divine. I am beautiful and desirable. fearlessly in my human sexuality. needs with independence and joy. I honor the survivor in me. I honor the warrior within. This candle comes dressed (including the straight pins) and ready to light! Be careful when you take it out of the box. If you happen to dislodge a pin, no problem, simply re-insert it. 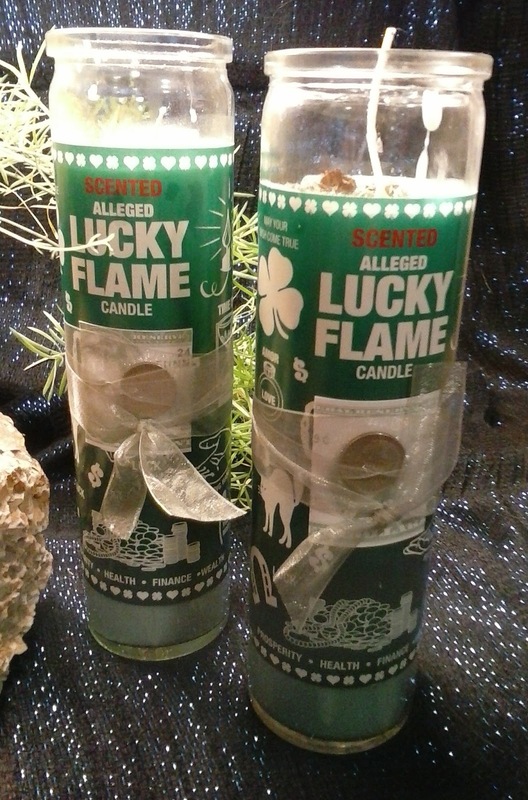 Would you like to create your own spell candle for Abundant Prosperity? I think everyone deserves Abundant Prosperity, so if you really want to make your own candle, here's a link to my blog where I tell you exactly how to create this candle. 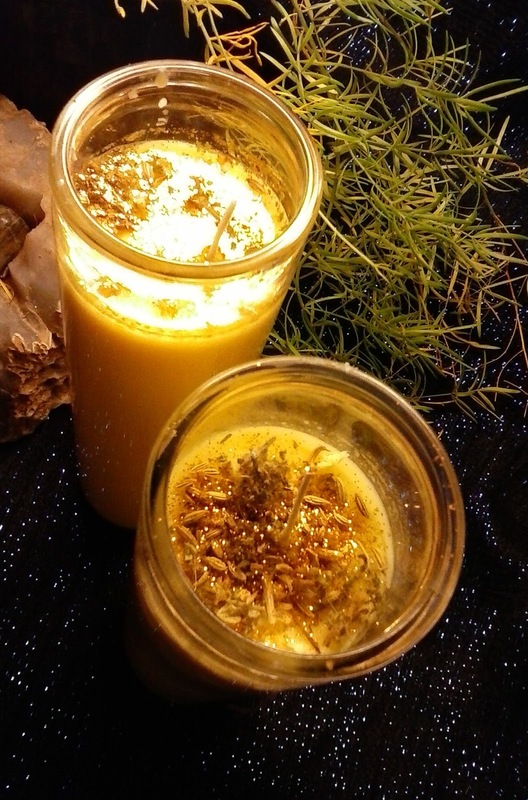 *Note ~ These large purification candles are layered in herbs, and when these herbs catch fire, these candles burn fast and furiously. Never leave any candle burning unattended, but also take the extra precaution with these candles of burning them in strong fire-proof container. Would you like to dress or "fix" your own spell candles? Here's some videos that will show you how. Hello, Visitors! 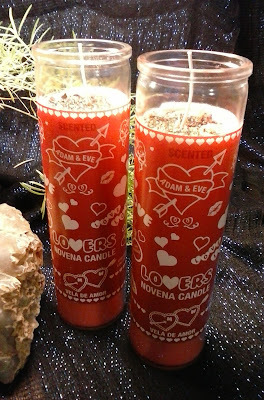 I received a question about love candles (and the Witch's Bottle, Drawing in Love) that I'm going to answer anonymously here-- it was a good question! 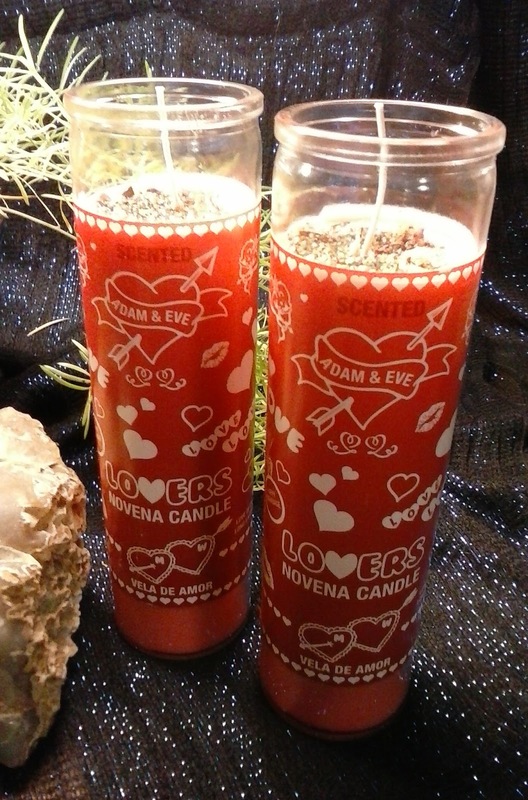 "Can I use the love candles and witch's bottles sold here to draw in a PARTICULAR person? "...the answer is "YES!". I know this is frowned upon by some people as interfering with the free will of another, and it slides into the gray area of magickal practice and all the debates and hoopla that go with it. But I believe that each person is responsible for their own decisions, and if it's one particular person that you wish to target for your spell, so be it, that is your business. HOW...it's really pretty simple. 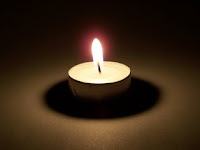 For candles, if you're using one of the glass enclosed candles, as shown above, simply write your targets name on a piece of paper, fold it up, and place it beneath the candle. You can do the same for the Witch's Bottle, unless it's a bottle that opens, and then you can place the piece of paper directly in the bottle and recap it. 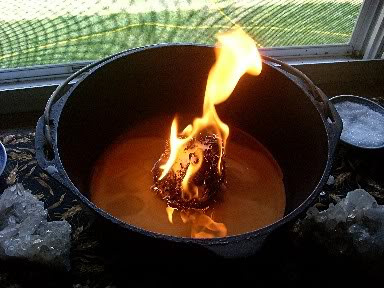 If you're using a regular wax candle, simply carve the target's name and your name into the candle, working from the bottom of the candle, up the side, toward the wick. Much luck with your love magick! Do we have to do anything with the bottle or just keep it? I still cannot believe the things you have told me on your readings! how would a stranger know such details that I did not even share with close friends and family? It would be a great experience to meet you in person! Keep the bottle in a safe place. If it's a romantic love you're drawing in, the bedroom would seem like a perfect spot (I'd place it beneath the bed). Do you want to add a little extra "oomph" to the spell?....sit the bottle on a plate, sprinkle a little Ginger around the bottle to "speed things up", and then personalize it...you can add "personal concerns" that belong to the target to the plate if you are so lucky as to have some (a strand of hair, fingernail clippings, a napkin that's been used by the target, a button from their clothing, dirt gathered from their foot-print left on the ground, etc.) Be creative. I'm so glad to have made such a strong connection! I'm delighted that you're so happy with your readings, and I think it would be cool to meet you too! Have fun with your magick...because it is fun and exciting, you know. I like to tell people that "Witchcraft is a Hoot." For other people coming upon these comments, be sure to check out the page for "Witch's Bottles", you'll find it in the menu at the top of this page. Do we have to burn the candle continuously? No! 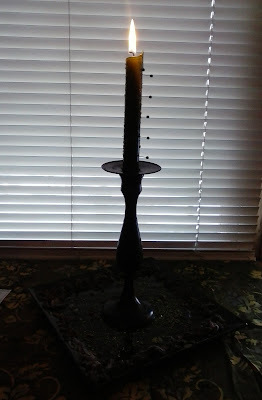 These tall glass enclosed candles are a vigil candle. They'll burn over the course of 5-7 days. 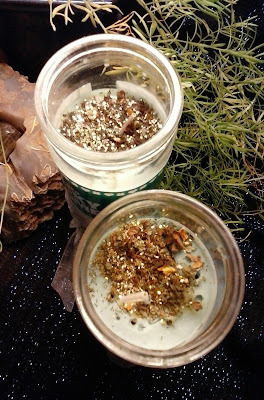 Only burn spell candles like this when you are going to be home and can attend them. At night when you go to bed, or if you leave your house, SNUFF them out (don't BLOW a spell candle out). You can use a small glass, or a regular candle snuffer, or a flat plate, just something to smother the flame. When you're ready to re-light your spell candle, go for it. Some people like to speak and repeat their intention when re-lighting the candle.